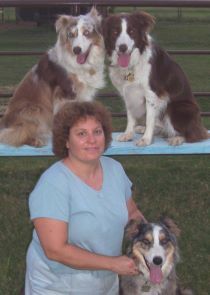 We are a small rescue dedicated to the rehabilitation, education and re-homing of neglected, abandoned and unwanted Australian Shepherds in Arizona. We are very health oriented and do our best to verify health status of all our dogs. These dogs are rescues and adopters need to understand that a complete and verifiable health history is typically unavailable to us as in the case of stray or shelter dogs. All dogs adopted from AAFR will be spayed or neutered, vaccinated, combo tested and microchipped. Any dog suffering illness or injury will receive necessary treatment and medication. We do not have a shelter so all of our dogs live in fosters homes until they are adopted to their new forever home. Each dog goes to their new home with a collar, leash and their microchip id tag on. We provide counseling on training and behavior to our foster homes, potential home and new homes and those contacting us regarding placing their dog with us due to problematic behavior.